Lassen GmbH is flexible to possible changes. 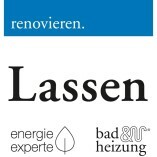 Lassen GmbH outlines individual actions adequately. 12/04/2018Frau Martin - wäre mir lieber ohne N.